I was going to end July 4th with a 3rd post, but by the time Mom and I got home from the fireworks, by the way they were exceptionally sparkly and Mom really enjoyed, I'll always have happy memories of our times together. Then I had to reboot my computer, so now we begin July 5th. A simple beginning, no bling, no zing, sometimes it's nice to come up with a pleasant simple card. 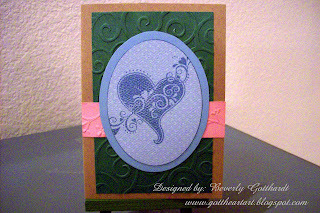 Supplies: Card Blank-Kraft Note Cards 4" X 5.5" Hobby Lobby, hunter green card stock-Stampin Up Patterns Pack II, blue and blush from my paper stash, General's Pastel chalk pencil-rose, Cuttlebug Embossing folders-Just My Type, D'Vine Swirl, Fiskars Shape Cutter-Ovals-1, Stamp: CTMH-D1309 Heartthrob, Ink-CTMH-Z2160 Twilight. Great card! Thanks for playing along with us at Color Dare this week. Very pretty! Thanks so much for playing along with the sketch challenge.